The Testo 810 air and surface temperature meter, part of Testo's innovative 'pocket sized' range of measuring instruments, is a 2-channel temperature measuring instrument, an infrared thermometer with laser measurement spot marking and an integrated NTC air thermometer. 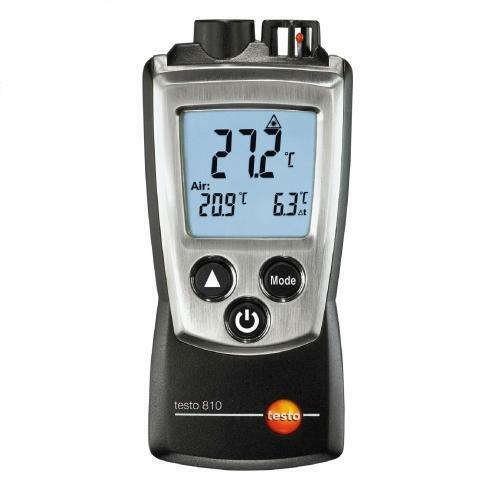 The Testo 810 measures the air temperature and simultaneously the surface temperature by infrared without contact. This allows the surface temperature of a radiator, an air vent or a window to be conveniently compared with the air temperature in the room. The infrared measurement is carried out with 1-point laser measurement spot marking and 6:1 optics. The difference between air and surface temperature is automatically displayed.